During this period Swamiji exhibited intense spiritual power, which was corroborated by Swami Akhandanandaji. The latter had met Swamiji around this time in Mandvi, Gujarat. He said that he was astonished to see the change in Swamiji's face, which had a sublime, divine radiance. Now we can understand why Swamiji told Haridas Babu that if someone helped him with the passage money, he was prepared to go to America. Haridas Babu recognized Swamiji's great personality and wanted him to extend his stay in Khandwa. But Swamiji had to make his pilgrimage to Rameswaram. So he could not extend his stay, nor could he keep halting at other places. Seeing Swamiji's resolve, Haridas Babu gave a letter of introduction to his brother in Bombay and told Swamiji that his brother would introduce him to Seth Ramdas Chabildas, a wellknown barrister there. He then bought for Swamiji a train ticket to Bombay. Swamiji reached Bombay in the last week of July 1892. There, Haridas Chatterjee's brother introduced Swamiji to Ramdas Chabildas, who received him cordially and requested him to be his guest. Swamiji agreed. 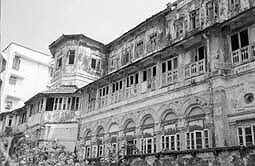 In January 2003 the present author located the house of Ramdas Chabildas with the help of two descendants of Chabildas Lalubhai. It stands on Dorab Shaw Lane, Napeon Sea Road, Bombay. (4) Some photographs of the building are included in this article along with their description. 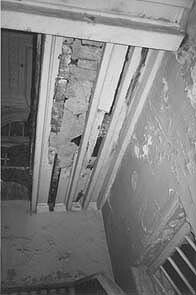 The author found the house in extremely dilapidated condition. 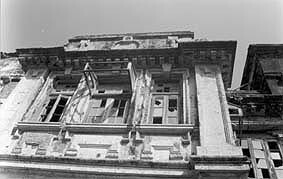 Only the front porch was in use, by security guards, who were manning the place on behalf of its present owner, Sri Bilasrai Mahavir Prasad Badriprasad. The house is a threestoreyed building, known as Samudra Villa. 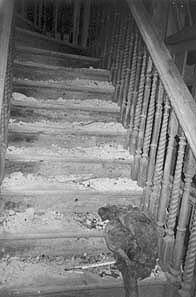 Except for the porch all other areas of the house are unsafe for human habitation. 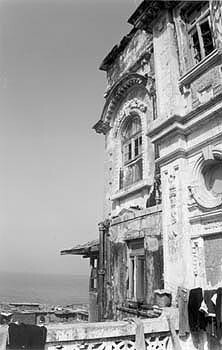 Situated beside the sea, it has long balconies on the first and second floors and matches Swamiji's description of it. After a lot of coaxing, the guards allowed the author inside to have a look. The author has some knowledge of architecture and building construction. After analysing the style of construction and the materials used, he feels that the house is more than 150 years old. The ground floor has stables that can accommodate six to eight horses. Stables in a residential building speak of the owner's wealth. At the rear are utilities like toilets and servants' quarters in a separate threestoreyed building. The main house is connected with the utilities at every floor. 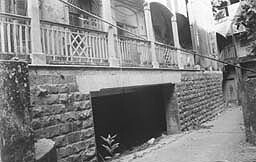 This house belonged to Seth Chabildas Lalubhai, who was one of the wealthy merchants of Bombay. We have the sale document of the Samudra Villa, dated April 1916, executed between Kesarbai, wife of Chabildas Lalubhai, and the purchaser, Dorab Shaw Bomanjee Dubash, a Parsee. That explains how the lane got its name. It would be a good idea if, with permission from the headquarters, the local Ramakrishna Math arranges to put up a small marble tablet near this bungalow to commemorate Swamiji's stay there during JulyAugust 1892. In 1875 Ramdas Chabildas was a student of Elphinstone School, which has all along been a prestigious institution. (5) Later he went to England and earned his postgraduate degree in arts around 1884 and then his law degree. On his return to India the government honoured him with a walking stick with a goldandsilver handle, for becoming the first Indian barrister. Ramdas Chabildas was also a Sanskrit scholar, well grounded in the Vedas and the Upanishads. Apart from Swamiji, he had hosted at his bungalow eminent spiritual personalities like Swami Dayananda Saraswati. So his house must have resonated with religious debates and discussions. (6) He was a staunch Arya Samajist and a founder member of its Bombay branch. From Swami Dayananda Saraswati he received training in basic Sanskrit and in composing kavyas. On Dayananda Saraswati's demise in 1883, he composed a twentyoneverse tribute to him in Sanskrit. It is significant that the Arya Samaj of Bombay had about 100 founder members in 1875. Among them Chabildas Lalubhai was prominent. From Bombay Swamiji went to Poona. At the railway station he was introduced to the renowned scholar and patriot Lokamanya Bal Gangadhar Tilak, who was his fellow passenger. Tilak says in his reminiscences, 'At Victoria Terminus a sannyasin entered the carriage I was in. A few Gujarati gentlemen were there to see him off. They made the formal introduction and asked the sannyasin to reside at my house during his stay at Poona.' (8) We can safely assume that among the group of Gujarati gentlemen were Ramdas Chabildas and Shyamji Krishna Verma, his friend and brotherinlaw. After getting his law degree, Ramdas Chabildas started his practice in Bombay. Later, in the late 1880s, he began his practice as barrister in Nagpur. (9) He purchased a twoacre property at Civil Lines from the Baxi family and built a large bungalow, Jamna Villa, named after his wife Jamnabai. (10) The Baxis were neighbours of Ramdas Chabildas. 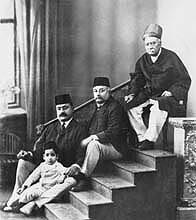 Ramdas Chabildas had two sons, Suryakant and Jaisen, both barristers. Suryakant died when he was about forty, leaving behind three sons and two daughters. Jaisen practised as a barrister in Nagpur and was elected mayor of the city. The Corporation of Nagpur honoured him by naming one of the city's neighbourhoods as Ramdas Peth, after his father. Suryakant's eldest son Janak was a commander in the Indian Navy. At present, Ramdas Chabildas' property is all sold and his descendants are living mainly in Bombay, except for one in Nagpur. On the said property there still exists a memorial that preserves the relics of Ramdas Chabildas and his wife. Two marble tablets on the memorial say Ramdas Chabildas died on 22 October 1920 and Jamnabai on 10 January 1914. 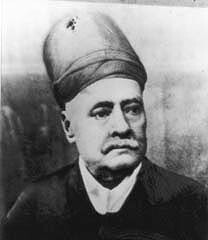 Chabildas Lalubhai was born in Bombay in 1839. He was a Suryavanshi Gujarati, a kshatriya belonging to the Chevali Bhansali community. Bhansalis are descendants of King Bhanusal, who ruled in the northwestern part of India. Their family deity is Mother Hinglaj. Hinglaj is a place in Baluchistan (now in Pakistan) popularly known as Marubhumi Hinglaj ('desert Hinglaj'). It is one of the shaktipithas of Mother Sati. A journey to Hinglaj is very difficult due to its hostile terrain. Swami Trigunatitananda had visited this place on pilgrimage. In later times, the Bhansali community came further down from the northwest, and some of them settled in Kutch, Sorath (Kathiawar), Surat, Sindh and Cheval. So they are called Kutchi, Sorathi, Sindhi and Chevali Bhansalis. Being Gujaratis, the Bhansali community preferred to do business and trade. Chabildas Lalubhai's father was Lalubhai Jairamdas; he was in the British Army. 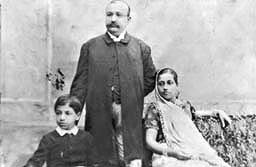 At the young age of thirteen years Chabildas Lalubhai joined Messrs Cullar Palmer & Co at their Bombay branch for Rs 15 a month. From the beginning his mind was set on starting his own business. So after gaining some experience he gave up his salaried job, purchased some big countryboats and used them for carrying freight to and from foreign steamers at BhavchaDhakka (Bombay seaport). This enterprise of his was highly successful. Gradually he became one of the foremost business magnates and owned his own steamship named Galileo for doing business with foreign companies. Galileo was insured for Rs 5 lakh. At that time English cloth was hugely popular and much soughtafter throughout the world. Chabildas Lalubhai took advantage of this business boom. He imported English cloth and amassed huge wealth by selling them to wholesale traders in Bombay. He also had a factory in Jamnagar, Saurashtra, where decorative goods were made from ivory. He exported these and other prime goods to Britain and France. Since he was the first visiting Indian trader to France, the French government honoured him with a letter of recognition. When Swamiji visited Bombay in 1892 there were trains plying between Colaba and Andheri. Since the Kanheri caves are about 22 km from Bombay it can be presumed that along with Ramdas Chabildas and Chabildas Lalubhai Swamiji may have taken the train from Grant Road (which is nearer to their bungalow) to Andheri and then proceeded to Borivili by horse carriage, or they might have used an eighthorse shigram carriage from the Napeon Sea Road bungalow. Chabildas Lalubhai had a spacious bungalow in the western part of Borivili, a suburb 20 km away from the city, along Lokamanya Tilak Road and west of Factory Lane. He had purchased it from Seth Jayram Bhatia. At this bungalow, he used to entertain his British friends and business contacts. From Borivili, the Kanheri caves are very near. Whenever guests arrived, about forty people were hired to light the bungalow with Petromax (gasoline) lights in the evenings and also to carry delicious food to Kanheri, where some sort of picnic lunch was usually arranged. Gamavati Seth, one of the descendants, gave us this information. It is quite possible that Swamiji too may have been lodged in this bungalow for a few days and similarly entertained. After Chabildas Lalubhai's death, his wife Kesarbai and their two sons Janmeyjay and Bhadrasen and their families lived in this house. The building does not exist anymore. 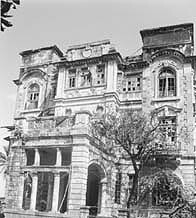 Some two decades back, Hansaben Goragandhi, daughter of Janmeyjay, inherited the property and demolished the bungalow to raise a multistoreyed apartment building. Swamiji might have easily acquired the Kanheri caves because he knew that if he asked Ramdas Chabildas to give them to him for his future work, both Ramdas Chabildas and Chabildas Lalubhai would have readily agreed, because it was then one of their properties. Even though Chabildas Lalubhai had amassed immense wealth, he was a devoted and benevolent person at heart. During the plague of 1874, he built shelters on his own land in Goregaon, a suburb of Bombay, for the benefit of the people, who were fleeing the city. Later, during a famine, he provided food, clothing, shelter and every kind of necessity to hundreds of orphans for a whole year. There are around fortythree Ram temples in Bombay built by rich Gujarati businessmen; the one in Gulalwadi was built by Chabildas Lalubhai. (14) In his last will Chabildas Lalubhai mentions the construction of (a) hospital open to all, (b) a sanatorium for Hindus, (c) a lodge for poor Hindus, (d) industrial and technical schools and colleges, and (e) scholarships for students of all communities. In his letters to his friends and disciples, Swamiji spurred them on to engage in some kind of business, like selling Indian goods in the United States, rather than cajole their white masters to give them jobs. The story of Chabildas Lalubhai's success, his rise from rags to riches by doing business very much agreed with Swamiji's thinking. Swamiji appreciated his enterprising nature. 1. To the descendants of Chabildas Lalubhai: (a) Smt Gamavati Seth, daughter of Sri Janmeyjay Chabildas and his first wife; (b) Smt Hansaben Goragandhi, daughter of Sri Janmeyjay Chabildas and his second wife. She gave us Chabildas Lalubhai's photograph; (c) Sri Suryakant Seth, son of Smt Gamavati Seth, who identified Chabildas Lalubhai's Napeon Sea Road bungalow; (e) Sri Harishbhai Khot, son of Sri Bhadrasen Chabildas. He was the second descendant who identified Chabildas Lalubhai's bungalow on Napeon Sea Road and gave us a copy of the sale deed of the said bungalow and also its photograph. 2. To the late Sri Mahendra Seth, son of Smt Gamavati Seth. He helped us by getting most of the newspaper references and the will of Chabildas Lalubhai. 3. To (a) Sri H L Ganjawala, corporate architect and chartered engineer, for acquiring the layout plan of the Napeon Sea Road bungalow; and (b) Sri Manesh Ganjawala, architect and interior designer, for taking pictures of the bungalow. 1. Mulchand Verma, 'Both Mira Road and Bhayander Owned by Gujarati Seth Chabildas Lalubhai' (Gujarati) in Mumbai Samachar, 14 May 1991. 2. Hemchandra Narsi, 'On Sri Ram Temples in Bombay' (Gujarati). 3. Chabildas' will dated 12 August 1914. 4. Sale deed of Chabildas Lalubhai's bungalow on Napeon Sea Road to Dorab Shaw Dubash, dated 1 April 1916. 5. 'Daring Businessman Chabildas Lalubhai' (Marathi) in Upanagar Dhvani, 14 August 1979. 6. A M Khadilkar, A Brief Introduction on Chabildas Lalubhai (Marathi pamphlet). The author is headmaster of Chabildas Lalubhai Boys' High School, Dadar, Mumbai 400 028. 7. 'Centenary Celebration of Chabildas School' (Marathi) in Navkal. 8. Sri Prakash Bhandari, 'Letters Recording Vivekananda's Troubles in the US' in The Times of India, 6 March 1999. 9. 'Outline of Chabildas Lalubhai' in Bombay Chronicle, 7 December 1914. 10. Kishore A Hursh, 'To Work for the Freedom of India Became His Duty' (Gujarati) in Saptahik Dastan, 22 December 1955. 11. 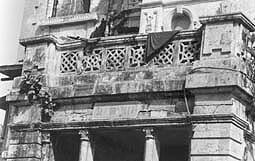 Vishnu Pandya, 'The Last Will of Shyamji Krishna Verma' (Gujarati) in Janmabhumi, 12 January 1994. 12. Mangal Bhanushali's Gujarati article in Smarananjali. 1. His Eastern and Western Disciples, The Life of Swami Vivekananda, 2 vols. (Calcutta: Advaita Ashrama, 1, 2000; 2, 2001,), 1.302. 3. The Complete Works of Swami Vivekananda, 9 vols. (Calcutta: Advaita Ashrama, 18, 1989; 9, 1997), 8.13. 4. In 1973, the author's mother, Smt Lilavati, and Srimat Swami Gautamanandaji Maharaj, President, Sri Ramakrishna Math, Chennai, had gone to Mansen Kursandas' house to find out the letters of Swamiji written to Ramdas Chabildas and his father Chabildas Lalubhai, but they could not find any. Mansen was Ramdas Chabildas' nephew and lived in Tin Batti, Walkheshwar, Bombay. 5. History of Arya Samaj (Hindi), 1982, 1.2624. 6. Upanagar Dhvani (see item 5, 'Acknowledgments'). 8. His Eastern and Western Admirers, Reminiscences of Swami Vivekananda (Calcutta: Advaita Ashrama, 1994), 20. 9. Reported by Mulchand Verma in Mumbai Samachar, 14 May 1991. 10. The author gathered this information in August 2003 from Smt Motabai Baxi, who is now ninetyfive years old. 12. Heard from Smt Hansaben Goragandhi. 14. From the aforementioned Gujarati paper by Hemchandra Narsi (see item 2, 'Acknowledgments'). 19. Akshay Kumar Ghosh's unpublished letter to Sri Jagmohanlalji, Dewan of Khetri; by courtesy of Swami Vivekananda Complete Works Committee, Belur Math.